Wabi-Sabi: One of the Greatest Political Upsets in American Political History? One of the Greatest Political Upsets in American Political History? 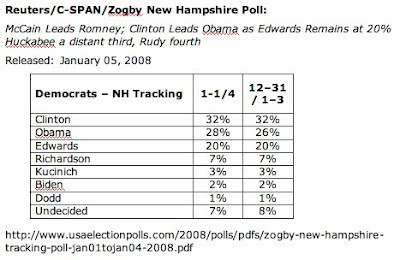 That's how NBC's Tim Russert characterized Hillary Clinton's "upset" win in the New Hampshire Democratic primary. Sorry Tim, but I don't see how Clinton's win is that big of an upset. A surprise perhaps, but not an historic upset. Let's not forget that less than one week ago the polls showed that she was ahead. She won a good victory Tuesday night, but it's hardly an historic victory. Certainly not "one of the greatest political upsets in American political history." So she was ahead by 4 points on Jan. 5th (and pretty much all of 2007), and she won by 3 points on Jan. 8th. UPDATE: I should note that Hillary Clinton's victory is historic in regard to her status as the first woman candidate to win the New Hampshire Presidential Primary. That is definitely historically significant; however, Russert's comments were based on her "miraculous" comeback. That's the conclusion with which I disagree.